We are pleased to present this information on Bell'O wood audio video furniture, as shown and described by the manufacturer. Because we have not tested this product, we are unable to endorse it or provide you with any additional information. Bell'O® International, a leading designer and manufacturer of audio video furniture and accessories, enhances its existing wood line with new units that provide a "hearth and home" feel to your interior design. While most flat-panel TVs have a very contemporary look, Bell'O recognizes that many consumers still want their home to look and feel traditional. Thus, the company has added six new cabinets to infuse any room with a classic look and feel that makes a house a home. 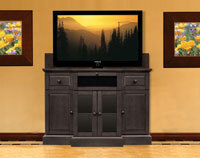 These elegant wood products include an elevator model that reveals and conceals your TV with a remote control. With impeccable detailing, wood construction, and versatility to fit in any room of the house, the new Bell'O wood models unite style, durability and practicality. These fashionable units are manufactured to accommodate flat panel TVs of all types, including plasma, LCD, DLP, projection and micro-display. They hold a center channel speaker and all come equipped with a CMS® Cable Management System to conceal wires and provide optimum air circulation.